COSCOI, an animation character development and digital contents company in Korea, released two smart edutainment apps for kids Go East! Coloring and Go East! Xylophone, developed as part of COSCOI Friends series using Go East, its typical intellectual property in animation. SEOUL--(Korea Newswire) August 27, 2018 -- COSCOI, an animation character development and digital contents company in Korea, announced that it has released two smart edutainment apps using ‘Go East,’ its typical intellectual property in animation. ‘Go East! Coloring’ and ‘Go East! Xylophone,’ educational apps for kids developed as part of ‘COSCOI Friends’ series, are launched on Google Play. Go East! 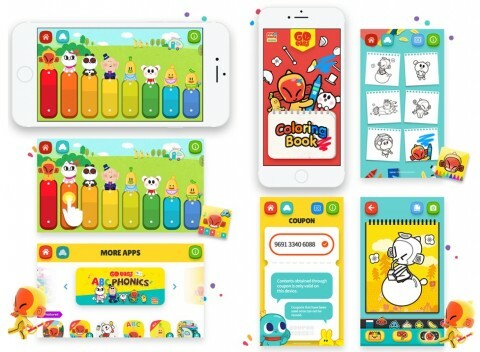 Coloring is a learning app that will let kids color cute characters of Go East, COSCOI’s intellectual property in animation, which is based on ‘Journey to the West,’ a Chinese novel. Children can use stickers as well as a wide array of pattern brushes that will make coloring even more fun. The app has “auto paint function” which will paint original character colors automatically. This is for babies and toddlers who may have difficulty choosing colors. About 40 different brushes, stickers and patterns kids can choose from will never bore them. Go East! Xylophone will let kids play the xylophone together with lovely characters of Go East. Each time they play the xylophone, characters dance. Children can learn music naturally as they play the xylophone as they like. The app will be updated with a new easy-to-follow function. Using this function, kids can play songs just by tapping the xylophone keys in order of the notes appearing on the monitor. The app series of COSCOI Friends are COSCOI’s first education business project under its vision of providing “global contents which will breathe new life into characters.” The apps are distributed to 135 countries at the same time. COSCOI has also completed the development of Mobile App Service (MAS), a mobile app management tool used to launch and manage various apps.